It's a Scrappy World: 1-11-18! New Year New Fun with Old Favorites! 1-11-18! New Year New Fun with Old Favorites! Today is Thursday, which for all of us at Bugaboo Stamps means it's the day when we showcase our well loved, older Bugaboo Stamps. 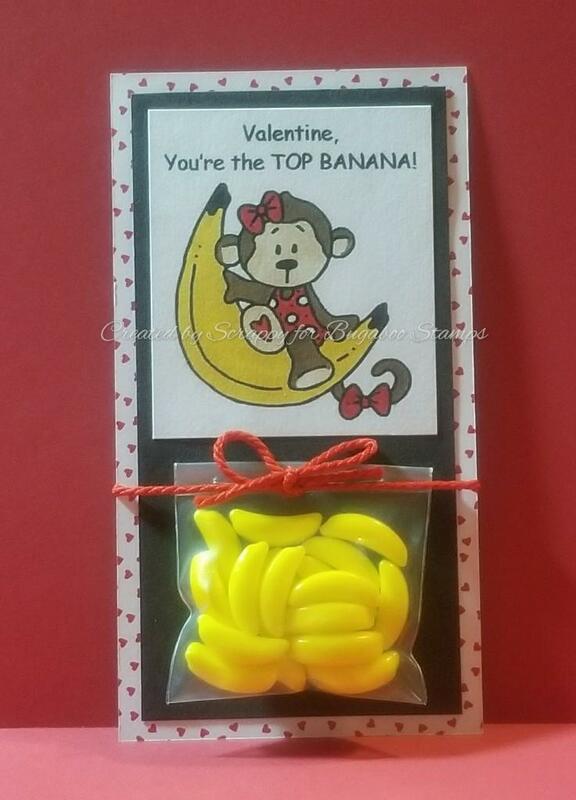 My project below featuring Banana Monkey is my prototype for my daughter's Valentines. I hope all of her friends like them! Check out some more of my DT sisters work on the BUG BLOG! What a adorable card. Love the details and cute digi. Thanks for your entry in our challenge at Tuesday Throwdown! Happy Crafting! Oh my goodness, how cute is this! Eeeek! Yes, regardless of their age, your daughter's friends will love this! Thanks for sharing with us at SOS... Visit more often! Too cute. Love the image. Thank you so much for joining us at Polkadoodles Digi Choosday and best of luck with your entry. Your daughter's friends will totally love this super adorable Valentine, I think those little candy bananas are so cute. Thank you for sharing with us at SHOPPING OUR STASH. It's a Bugaboo Birthday BASH!! !